The rip in the fabric of space time between our universe and the bizzaro universe, where I am a SharePoint expert, continues to grow. First I presented a 400 level SharePoint session at TechEd and now I have helped put together a SharePoint presentation for PDC! “Creating SharePoint Applications with Visual Studio 2008” presented by Chris Johnson walks through creating a SharePoint application using the Visual Studio 2008 extensions for SharePoint (VSeWSS). A bunch of people from Intergen contributed to the end product. I helped write the overall script with Mark Orange, one of Intergen’s actual SharePoint experts, and I wrote the application used in the presentation. 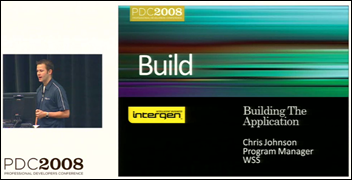 The application featured a new project announced at PDC: the Silverlight Control Toolkit. 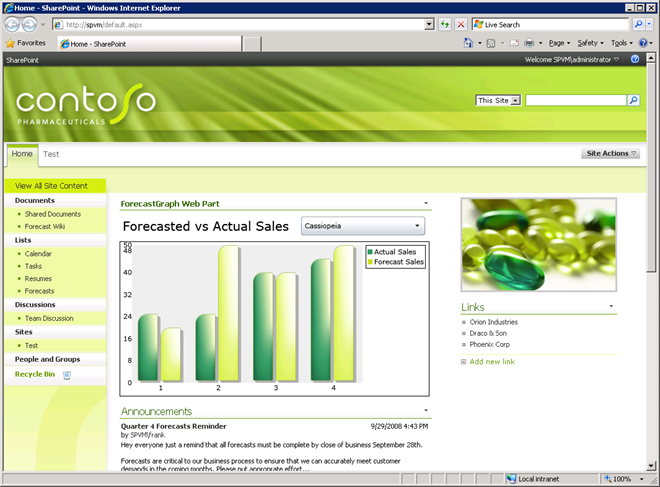 SharePoint hosted a Silverlight chart control that visualized data called from a WCF web service and SharePoint’s web services. The Wellington .NET usergroup had a special event last week covering what was announced at PDC. I gave a brief 15 minute introduction to using the Silverlight chart control. You can get the slides from my talk (all 6 of them!) here.